Ergonomics processes described in the literature have been associated mostly with manufacturing, financial, electronics, and office settings where working conditions tend to be rather constant and repetitive. 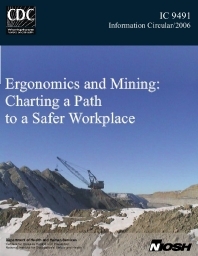 The information presented in this document demonstrates, however, that an ergonomics process can also be implemented in a setting such as mining where working conditions frequently change and workers are periodically exposed to extreme weather conditions. This document describes how Bridger Coal Company implemented an ergonomics process at its Jim Bridger Mine from 2001 through 2004. The process developed by the Ergonomics Committee, the promotion of the process to management and employees, and the impacts of the process on working conditions at the mine are reviewed. Barriers overcome and lessons learned are also described. Quotes from Bridger Coal Company employees are included in the document to add a personal perspective. Other industries with working conditions similar to mining, such as construction and agriculture, may find this information useful.